A Handy Gift Guide for the Men in your life. What with Summer round the corner, fathers day and that important birthday for the special man in your life, I thought it best to put together a Men’s Gift Guide – because let’s be honest we all know that one guy who we struggle to buy for. Hopefully this post will help you decide something special for them. [AD] This entry is on behalf of Panasonic who have paid for a mention and advertisement. Now no matter whom we have in mind, Dad, Husband, Best Friend or Milkman – more likely than not any and all men would love and appreciate a new shaver and this is where Panasonic steps in. Panasonic has recently unveiled a new range of shavers, trimmers and clippers. The full range can be found here on “Shavers Panasonic UK”. In particular, I am drawn to the ES-LV6Q. Quoted as “The Next Generation Shaver for the Distinguished Gentleman” The ES-LV6Q uses a Multi-Flex 5D head, 5 blade technology and a 14,000 CPM Linear Motor Drive that is all packed into a comfortable sized handheld unit that gives outstanding results and incredible closeness. Another great function to this unit that really bugs me with others is: say you have a mixed length of out of control beard and facial hair. Some razors, mine included, struggle to power through the fuller thicker sections. But with the ES-LV6Q it houses new sensor technology that can tell a thicker patch it coming and boosts the power to maintain the smooth action of trimming and minimises the skin irritation. I guess it’s like cruise control in the car – we don’t know HOW exactly it works, but it does and we love it. Unlike other electric shavers, this one has the function to work wet or dry, for a quick trim or a full-on soap and lather shave – this unit is waterproof and developed with Japanese Blade Technology, the same the Japanese use for the manufacture of swords – and we all know how good their swords are, well imagine that in a razor. Want him looking fresh, feeling fly and suave, then a new razor is always a great shout. As the main component in my bathroom in regards to my grooming regime, a trendy new razor will always be welcomed. [Note] This entry is non affiliated, I was suggested to promote the product via a blogger on twitter. There is no personal gain from this. Now let’s be honest this works out really well with number one. After a lovely shave you want to finish the job off properly don’t you, you want to splash a bit of balm on to soothe and freshen up your now newly suave looking face. This is where Miessence steps in, they are an innovative company focused on using Natural and Organic ingredients in products that work. Miessence are also 110% carbon negative, which means they offset more than they emit. So while freshening your face up you can feel proud you are doing your bit for the environment. With a couple of pumps to the fingertips, gently massage the face and shaved areas. This helps to calm razor burn and refreshes the skin. They also use marshmallow in this – so imagine that light and fluffy feel. Got to be worth a go right – treat yourself. . . . or him. Three. – Hoodies with Purpose. Now I know what you are all thinking, Ross this weekend was a scorcher – who needs a new hoodie. Well this one is a must. Firstly you want your man in comfort and fashion right, and to know he is doing his bit in support. The C9 Foundation is a Scottish registered charity with their main purpose is to tackle Mental Health within grassroots football, with teams and their communities. Run boy Colin and his awesome team, C9 is always striving to do the best, be the best and give the best back to the community and these hoodies and other clothing ranges, such as hats and shirts are one way of doing that. With the profits going to Mental Health charities, this hoodie really does have a purpose. Four. – The Pawfection Pack. [Note] This entry is non affiliated, I asked if I could promote the product via a blogger on twitter. There is no personal gain from this. This one is for the dog lover in your life, that person who’d treat his four-legged friend over himself any day and for good reason. The Pawfection team are a small local business based in Cambridgeshire – who try to deliver the best service and the most affordable pricing they can in their quirky, cute boxes. Now how is that for a handy guide, a selection of ideas, quirks and gift picks. Give them all a look, take them for a spin and treat that special someone right. I hope you’ve enjoyed this post, learnt and lot and maybe even thought highly of me. I am always here to help. Man vs Movies – Johnny Depp Edition. We’ve taken a break from our regular scheduled programming to interrupt this broadcast with a bitter-sweet post that is fitting after last nights bombshell of information about Amber Heard and the Domestic Abuse case against Johnny Depp. Oh how the tables have turned. This post was originally written last june to link to my post about Johnny Depp, which can he found HERE. But I got caught up with house stuff and never got it posted. But it’s been in the chamber ready ever since then and now is time. I have always been a fan and admirer of his and I am so glad this information has come out, it helps show that men can be and are victims too. Anyway let’s celebrate the man by going through my “Top Five” films. Featured before in this series. 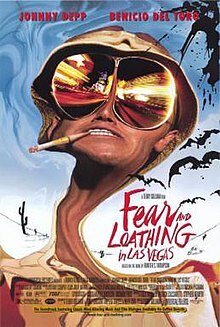 It’s an amazing biopic story of Hunter S Thompson a real wild card. To prepare for the role Johnny Depp went up to Aspen, Colorado and met HST to learn and interview him for the role. The story goes that he was waiting in a bar for hours and just as Depp was about to leave the door swung open and this mad man storms in carrying a cattle prod and a . . . I want to say Revolver, but it could be a bottle of whiskey. Either or – HST was a big fan of both. This was the start of their friendship and the film does Hunters life justice. The film is just a whirlwind of events fuelled by drugs and booze as the two leads scurry around the desert in an attempt to cover a sporting event. It might not be everybody’s cup of tea. But I love it. Based on Stephen King’s short story Secret Window Secret Garden. It follows a writer (Depp) who is stalked by a stranger claiming that the writer stole his story but changed the ending. As the twists and shocks carry on, Mort has to find away to prove he wrote the story first while fighting off this stalker. The stakes get higher and higher as the film climaxes with a shocking twist that leaves Mort’s world shaken. 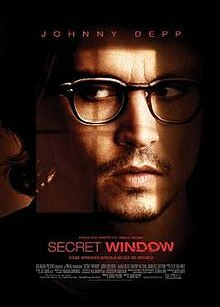 It’s a fantastic performance from Depp and if you like a good psychological thriller this one’s for you. For some people of my generation and younger this would be their first encounter of Johnny Depp and what a great way to get to know him. 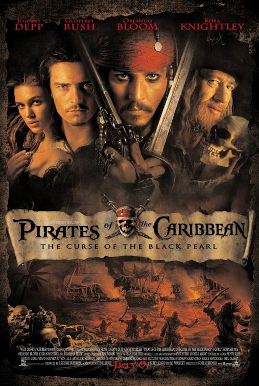 Swinging onto our screen as Captain Jack Sparrow, Depp takes the reins in this fresh new Pirate movie that takes its inspiration from a roller coaster at Disney World. This movie never gets old, it’s funny, exciting, different and yes they tried to milk it and make a few too many sequels but they are all a bit of fun and escapism which is what they should be. It also helped put a few actors back on the map and now are referred to as . . . so and so from Pirates. The last spot was a tough call. Like I have said I am a big JD fan and cutting his list of films down to five is a tough call. But I decided to go with Black Mass – another biopic that Depp gets to sink his teeth into and in my eyes nails perfectly. 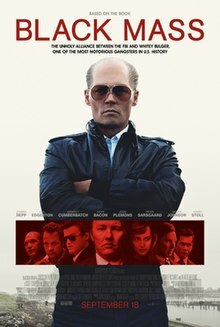 Black Mass tells the tale of James “Whitey” Bulger and the Winter Hill Gang, a crime organisation from South Boston in the 70’s. Showcasing Bulger become an informant for the FBI, in exchange for protection he effectively rats out other gangs and groups in an attempt to profit from their downfall. It’s a brilliantly acted piece that shows off Depps talents in yet another acting genre. I would love to know your favourite films of Mr Depp’s, let me know what you think to my list too. The ABC Movie Challenge – I stumbled across this tag on Ashli and Benny’s blog – You, Me and Benny. Which can be found Here – check them out. They run a great blog that covers all things geeky from Marvel love to Funko Pops. To lifestyle posts and everything in between. I liked the look of the challenge and decided to give it ago. As you know my film knowledge is wild and awesome and I love this topic. Let’s smash it. I am not going to tag anyone on here, I want everyone to see this as an invitation. If you have a spare moment to put a list together I would love to see it. Also the other day my friend came to me – he had compiled a list of his “Top 100 Films” and had somehow put them into order. To which he challenged me to make one. So I guess that is the next thing in the works. Would you want to see that?